The new state-of-the-art building at the headquarters of Pfeiffer Vacuum's subsidiary in North America. 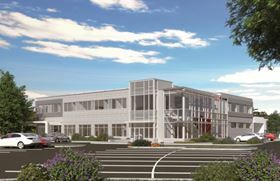 The new building will house the vacuum pump manufacturer’s North American headquarters for administration, sales, product management, marketing and customer care. Pfeiffer Vacuum's existing 24 000 sq ft building will be converted into a Service Center of Excellence, bringing together all service activities for the company's full portfolio. “These investments are further evidence of our ongoing commitment to support our valued customers throughout North America, while at the same time providing a modern, best in class work environment for our staff for many years to come,” said Dr Matthias Wiemer, a member of Pfeiffer Vacuum Technology AG’s management board. Founded in 1890 in Asslar, Germany, Pfeiffer Vacuum has around 2400 employees worldwide and more than 20 subsidiaries.